Playtech is a gaming company that has always delivered the best free online slots to the gaming market. Founded in England in 1999 Playtech puts quality and user satisfaction before anything else when creating Vegas slots. It has led the field in online casinos because it is dedicated to bringing the best games and services to its customers. 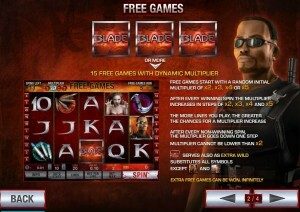 Blade is a classic free online slot by Playtech that takes you into the dark underworld of the Blade movie series. As a movie Blade is known for its gritty exploration of the world of vampires and the occult, led by Wesley Snipes as the movie’s titular main hero. 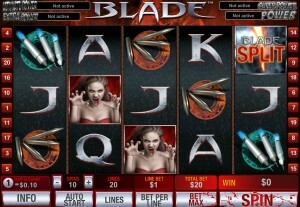 The slot game Blade recreates that excitement and suspense with each spin. You are guaranteed to get lost as you glide through the underworld, choosing your weapons to hunt down the Undead that try to get in your way. Fear is not an option when taking on the many foes to be found in Blade, and you can rest assured knowing that you have the power and tools to defeat your enemies and score great wins. 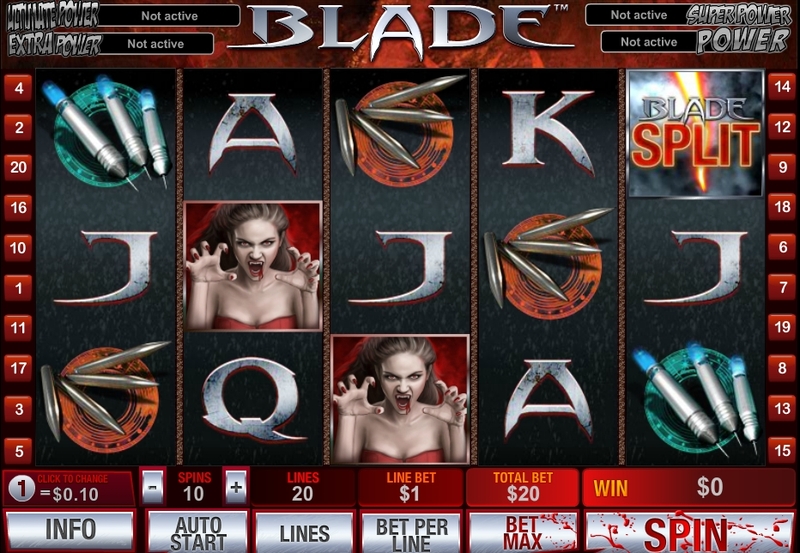 Become the hero of the world in Playtech’s Blade and stop the vampire invasion before its too late. 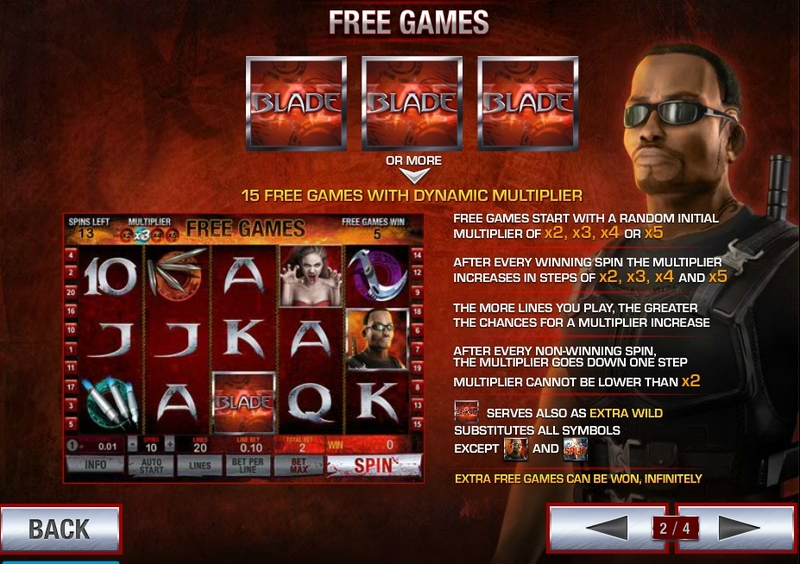 The world of Blade is presented with a dark game theme. The design includes a hellish red and orange background with black slot squares. Icons in this game include Blade, a female vampire, a machine gun, a curved blade and silver stakes. You will also find familiar icons such as the 10, Jack, Queen, King and Ace, all presented in bold silver. The bottom of the slot screen features an easy to read menu that is host to a range of useful statistics that will aid you in your gaming adventure. The colors and theme of Blade are true to the Marvel series. 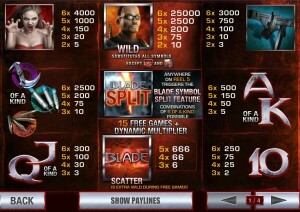 If you are a fan you will feel right at home when you play Blade. If you are unfamiliar with the movie or comic you will enjoy the darker adult theme of this slot. Special features in Blade are plenty. There are many different Jackpot winning styles including Power, Extra Power and Ultimate Power depending on which symbols you line up. You have a high chance of winning free spins and bonus games. Blade is fair when considering your outcome. The menu that is including below the main slot window has a wide range of helpful stats. You will see lines, bet per line, spins, total bet, winnings and minimum bet. This makes Blade a great choice if you wish to maximize your time gaming. Settings and optional audio are also included. With thousands of games to choose from on the Internet today it can be difficult to find one that suits you. When considering a game think about themes that interest you. 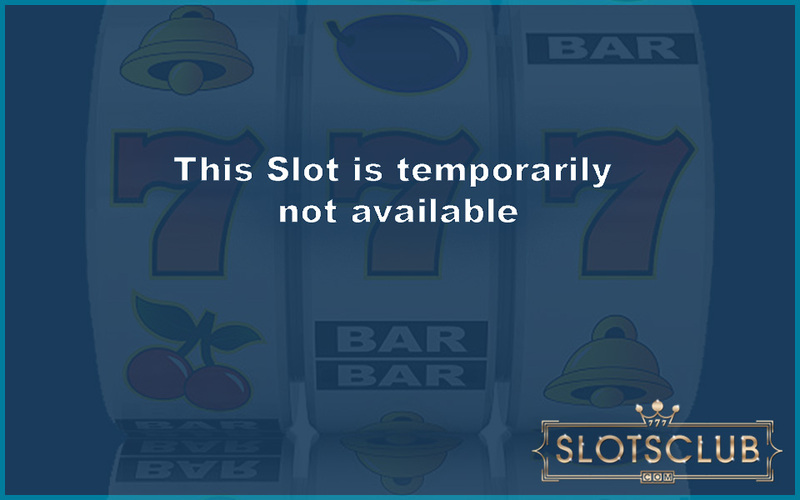 Also remember to go with a company that is trusted in the online slots world. 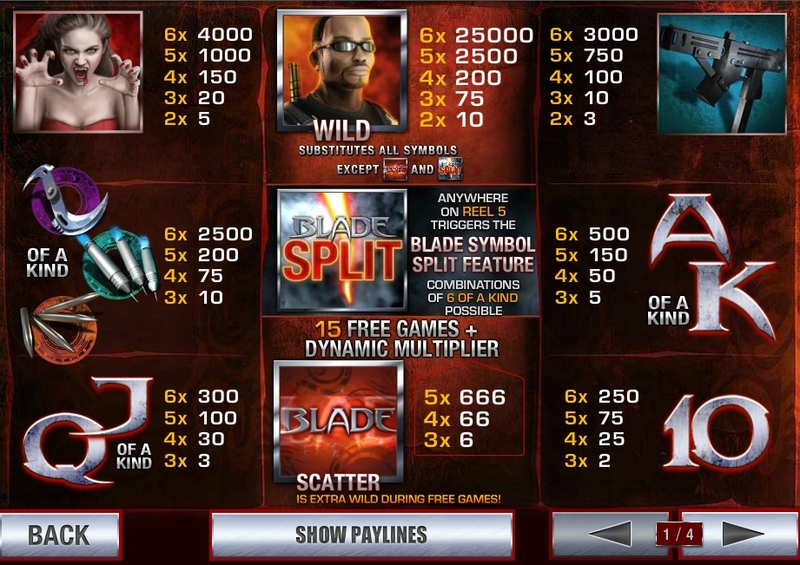 Playtech’s Blade is a game that is great if you want a dark themed slot game that offers you hours of fun, great winnings and a unique theme. 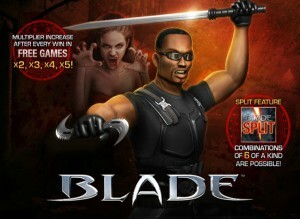 Do not let the fear of vampires and ghouls stop you from exploring the world of Blade. Take charge and carve your path towards huge wins and triumphant victory.